Perennial herb from woolly-hairy, woody stem-base and taproot; stems erect, numerous, simple, smooth except above, 10-55 cm tall. Basal leaves elliptic to oblong, 5-25 cm long, 0.6-4 cm wide, 3- to 5-veined, entire, stalked; stem leaves lacking. 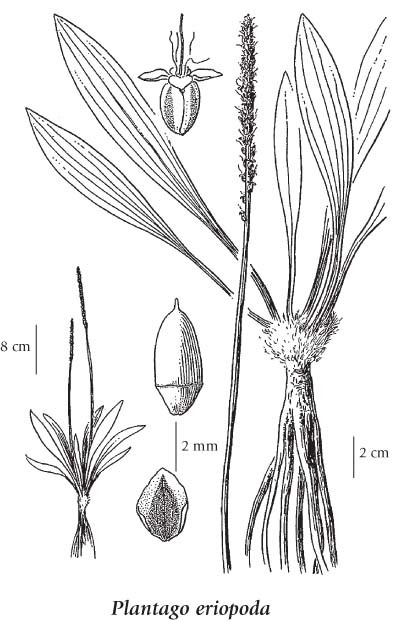 Inflorescence of dense to loose bracteate spikes, the spikes elongate, 5-20 cm long; corollas brown, 4-lobed, the lobes 1-1.5 mm long, spreading or reflexed; bracts egg-shaped to elliptic, appressed to the sepals; stamens inconspicuous. Capsules, egg-shaped, 3-4 mm long; seeds 2-4, ellipsoid, brown to black, 2-2.5 mm long, smooth to pitted. Wet to moist alkaline meadows and salt marshes in the montane zone; rare in NW and SE BC; N to YT and NT, E to PQ and S to NB, CO, CA and MX. "The family Plantaginaceae includes three genera and an estimated 250-275 species from diverse habitats throughout the world (Pilger 1937). In Canada, the family is represented by two genera containing seven introduced species and ten native species (Bassett 1973).